Occasionally throughout the baseball season, Just A Nats Fan hosts Baseball On The Barn for blog readers, writers, and Nationals fans far and wide. 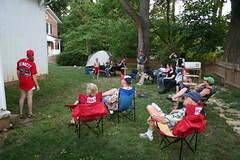 The idea emerged in 2005 and was put into action during the 2006 season for the general viewing public. BOTB is open to anyone with an interest in a baseball game viewing event with twenty or so of your closest stranger (or strange) friends previously only known on the internet. If you would like to attend an upcoming game, all you have to do is email misschatter at gmail dot com. Reminders will also be posted on Facebook. I’ve been asked how the idea to show games on the broadside of a barn came about. Well, it’s not that exciting of a story! My husband and I bought our house in 2002, taking a deep combined breath and plunging into the depths of debt we never imagined because we loved the historic house and it needed a lot of TLC. We’re house codependent – we thought we could “save” it :-) The house, built in 1893, and grounds were in a state of neglect (since oh, about the 1960s) and we figured we’d be on the 20-year plan to ever get close to making it presentable, but we went hog wild those first two years with a massive effort. We cleared the jungle of overgrowth, trimmed trees, and removed the sickly ones and the overgrown evergreens leaning into the house. On the property is an original “carriage house”, but it sounds pretentious and hey, the thing looks like a barn, so that’s what I call it. The weeds behind the barn were so tall and wild that we couldn’t even walk behind it. Once we cleared the overgrowth, we found an entire car transmission back there that we had to haul off (you know you’re a redneck if…). Ouch, my back remembers that well. The neighbors who live directly behind the barn invited us over to breakfast one weekend and commented on the “new view”. They actually didn’t like it. Out their large dining room windows is nothing but the large white expansive view of the back of a barn where before was jungle. Hmmm… we put our heads together. What could we do to make it more interesting? Paint one of those old timey tobacco ads or something across it? Plant a field of tall sunflowers? Mural? Due to the historic restrictions on what we’re allowed to do to the exterior of the house and barn none of those ideas were actually doable. We love the neighborhood and enjoy getting together with folks who live in the area, and were mulling over how we don’t get together often enough. My husband and I had also gone to a few Screen on the Green events on the Mall and enjoyed it, but found it difficult to do with kids. 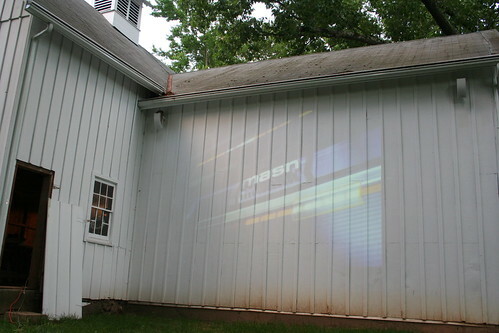 What about projecting movies on the barn for the neighborhood? Something that would recreate the fun of an outdoor movie, bring the neighborhood together socially on occasion, and solve the needing a babysitter/keep your kids out too late issue. I ran back to my computer to research how one would go about setting up their own outdoor theater, printed it out, and ran back. We looked it over and decided it was doable, depending on the expense of a projector. eBay is my friend! And thus On The Barn was born! We settled on a schedule of movies picked together and after a few chilly test runs last spring, opened it up to the neighborhood officially. Near the end of the season, I thought it would be great to also watch baseball games out there to simulate the large-venue feel of RFK. It was awesome! I sat out there nearly every night I could for the remainder of the season. This year, I thought it would be fun to invite baseball fans everywhere and the Natmosphere, particularly with the lack of ability to view the games in much of the area. I was a little nervous opening my house after the anonymity of the internet, but so far no stalkers or ax murderers have emerged. After seeing all the DC blogger and Metroblogging happy hours, it seemed to make sense that our little faction of baseball/sports blogs should have get togethers too and invite readers and commenters. So I boldly stepped… ah, you know… I took the leap. And it’s been a huge success, although I’m still tweaking it as I go along. Next year this page will post the schedule so it’s easier to find even if MASN is on Comcast by then. And feel free to invite yourselves to a movie as well!